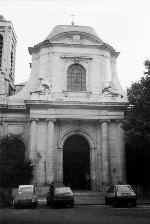 In February 1977, traditional Catholics liberate the church of St. Nicolas du Chardonnet in Paris. Msgr. Ducaud Bourget and Fr. Coache summon the faithful for a conference in support of the Archbishop, and direct them to the old church of St. Nicolas, only a few meters away. An astonished parish priest who is celebrating the New Mass for about 40 people has just announced that the church would be open only two days a week. Suddenly he sees an immense crowd filling the church respectfully and in reverent silence. A miracle? Yes, indeed, since at the end of this Mass, a processional cross announces the arrival from the street of the clergy who are going to celebrate the True Mass on the true altar. The supper table is removed, the priest escorted to the door, and the miracle of St. Nicholas continues until today. Fall 1977 sees 38 new seminarians, despite the condemnations. In October, the Society has 40 priests, 150 seminarians, 20 priories, and 3 seminaries. The sisters of the Society, founded in 1974, move their novitiate to Albano, and their general house to St. Michel-en-Brenne under the direction of Mother Mary Gabriel Lefebvre. 1978 sees the acquisition of 4 priories in France, a property in Long Island, and the priory of Madrid. The German seminary of Weissbad moves to Zaitzkofen. The Jesuit College of St. Mary’s, Kansas, is also bought by the Society. On November 16th, the new Pope John Paul II receives the Archbishop in Rome. After a long conversation the pope is willing enough to remove all restrictions on the traditional Mass, but Cardinal Seper standing back exclaims immediately, "They make a banner of this Mass," a remark which makes a negative impression on the pope. Meanwhile in Argentina, a humble seminary opens in Venezuela Street, in Buenos Aires, with 12 candidates. In June, an old inn is purchased at Rickenbach (Switzerland) to be our first General House. During summer, a large property is bought 20 kilometers north of Turin at Montalenghe (Italy), for a retreat house. The American seminary transfers to Ridgefield, CT. It was a magnificent success. More than 2,000 people came from everywhere. I wish that this place become a great sanctuary for all America, and a center of devotion and prayers towards the Blessed Virgin, who alone is only capable of stopping the moral corruption which does not cease to grow in this immense country. The experience of our first 2 schools of St. Michel in Chateauroux and of l’Etoile du Matin gives us great hopes for the truly Christian formation of young men and for vocations that will certainly spring in such an excellent atmosphere. May God allow our schools to multiply. Our attitude for the last 10 years must continue now without hesitation for the good of the Church, to help the authorities of the Church who want it to come out from the disorder in which they have imprudently engaged themselves. The conclusion of this anniversary must be depositum custodire, to keep the deposit of the faith, source of grace and sanctification. The teachers themselves have urged this foundation by addressing the Society of St. Pius X as the only institution capable of maintaining a sure and permanent doctrine for those spirits thirsty of truth. I have been able to confirm with great satisfaction the extraordinary development of the groups of faithful Catholics both at the chapels of our priest-friends and in the Society. St. Mary’s College, the school of St. Louis, MO, the beautiful chapel and rectory of Phoenix, and, at the last moment, the acquisition of a big church in Kansas City are reasons to hope for the continuation of the Church in the US. Econe sees the arrival of nine seminarians from Argentina who have come to finish their theology, but first need to learn French and Latin. We are asked from everywhere in the world to form and send priests. As of today I would need to have 150 or 200 extra priests to answer the requests of the faithful. 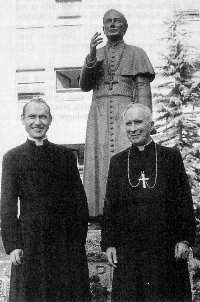 During an early year visit to the States, Archbishop Lefebvre dedicates the complex of Jesus and Mary in El Paso, Texas. In the afternoon of January 4th, 200 children are confirmed. 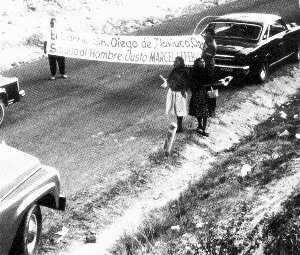 On January 6th, 4 years after a visa had been denied to Archbishop Lefebvre due to pressure put on the government by the bishops of Mexico, our founder crosses the border for what turns out to be a triumphant tour of the country of the Cristeros [see The Angelus, December 1993]. Followed continuously by the Mexican secret police, the Archbishop visits in the south of the country large areas of very poor Indians who, astonished, received an affirmative answer to their request for a truly Catholic bishop coming to support their fight for the Faith before the Communist clergy, sold to Liberation Theology. Archbishop Lefebvre He is received like a conquering hero, walking among cheering crowds of thousands in villages festooned with ribbons, garlands, and the magnificent fragrant flowers of those latitudes. Some natives walk as much as 100 miles through mountains to bring their children to be confirmed and to be able to kiss the episcopal ring and receive the blessing of Marcel Lefebvre, "el hombre justo." In Tlaxiaco, while the diocesan bishop celebrates the New Mass for 25 people, thousands attend the solemn ceremonies presided by Archbishop Lefebvre. In Rome, Cardinal Seper, the pope’s delegate for the dialogue with the Society, writes on February 19th, making allusion to the possibility of sending a cardinal to find a solution to the liturgical problem and the canonical situation of the Society. We hope that he will now be able to take some action at the level of the universal Church in the present crisis. I must acknowledge that the Australian priests, faithful to tradition, and the laity have worked very well during these last years. In my last trip in 1973, the groups of Sydney and Melbourne were composed by a few families; this time 700 faithful were present at the confirmations and Mass of Sydney, and almost as many in Melbourne, and about 150 in Adelaide, Perth, and also Wanganui in New Zealand. This region gives now great hope and deserves its first priory. 75 new candidates enter our seminaries. In Rome, Cardinal Seper goes to his reward. His last letter of October does not present any solution. Traditional Catholics are the only victims of tolerance and religious freedom, when in reality they are the ones who defend the truth. 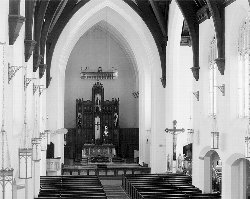 On March 1st, St. Joseph buys for us our first church in London, seating 300 faithful. Now we believe that the reform is evil, poisoned by ecumenism, and we refuse to accept it and we are obliged to advise all the faithful against it. God only knows how long the reformers will close their eyes to the destruction of the faith, of the morals, of institutions. The 21st century will be Catholic or it will not be at all. We have the absolute certainty that our position is legitimate, not by virtue of our arguments and ideas, but because we take our stand on that which the Church herself has taught us. For the Church, we wish to give our lives if it is necessary. The Society of St. Pius X is founded on the history of the Church and upon the doctrine of theologians. It believes that the pope can favor the ruin of the Church by choosing and letting act bad advisors, also by signing documents and decrees which do not engage his infallibility and that cause considerable damage to the Church. Nothing is more dangerous for the Church than liberal popes who are in a continual incoherence. We pray for the pope, but we refuse to follow him in his errors on religious freedom, ecumenism, socialism and the application of reforms destructive for the Church. Our apparent disobedience is true obedience to the Church and to the pope as successor of Peter in the measure that he continues to maintain holy Tradition... All the members of the Society have one desire, to be submitted in filial obedience to a Rome returned to Tradition. Fr. Franz Schmidberger is elected Vicar General with right of immediate succession as Superior General. In the seminaries, the course of studies is extended from 5 to 6 years. We have 60 new entries in Econe, Ridgefield, Zaitzkofen, and Buenos Aires.